The Faram history is easy to follow due to the fact that, until recent times, they were a relativley small family group, all related by marriage. (Ref: European and North American genealogical records.) Evidence of the Faram families can be found throughout Celtic history. The Faram family story spans more than 2000 years and of course is impossible to cover in this short article. It should be noted that the Faram Clan were not Templars, but military leaders, and therefore were not subject to the marital constraints of the Templars. It is not difficult to accept the Farams leading the Templars when you realize that the Farams trained the Nautical Templars, in Farum, Zealand, Denmark, prior to their going to sea. there is one floor level for each window. Hardly the way any structure would have been built except for defense. During research for the book "La Merica" an ancient pre-Celtic science was discovered, named Geoglyphology. This ancient science has been used for millennia by men in power to mark the territory which they claimed as their own. By identifying these territories, and matching them to recorded history, a larger picture can be established of the true ancient history of the world. 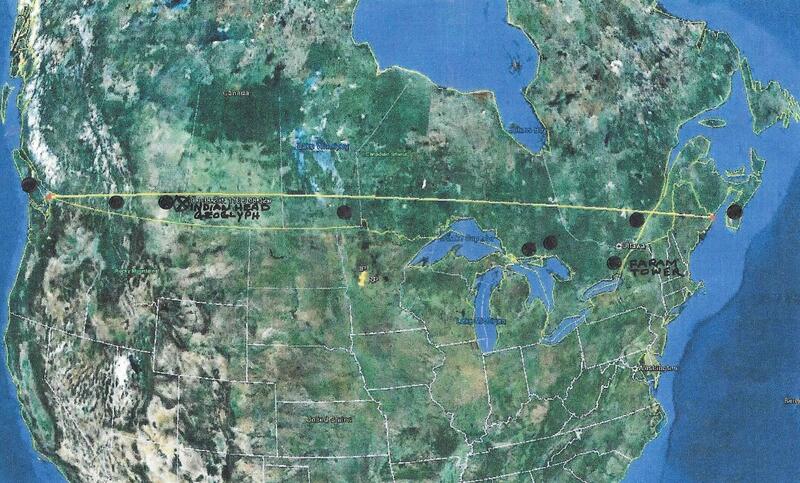 It was while applying these geoglyphic protocols that The Faram Research Foundation learned of the history of pre-Columbian America and the tower located at Maitland Canada. Similar Templar defensive towers have been located in Baltimore Maryland, Sulpher, Oklahoma and other locations throughout the Atlantic and the Mediterranean. These structures would have never been located without the application of the ancient science of Geoglyphology. 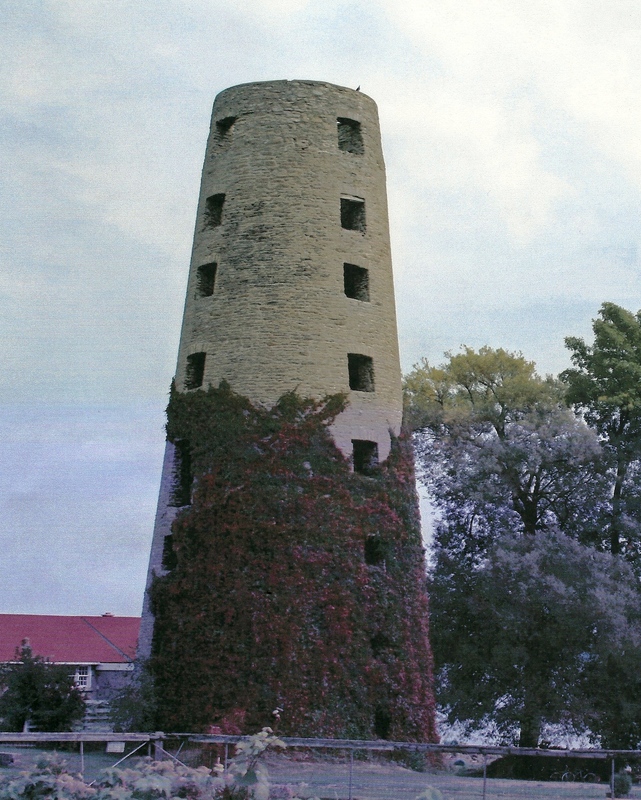 Through the application of Geoglyphology several geoglyphs, even in Europe, were found which point to the Maitland Tower as an important landmark. As you will notice there are/were geoglyphs on the grounds around Faram Tower which point back to the Celtic Faram/Farum's previous homes in Galicia, and Zealand, Denmark. Throughout history the Celts carried Tin and Copper to all the coasts of the Mediterranean. 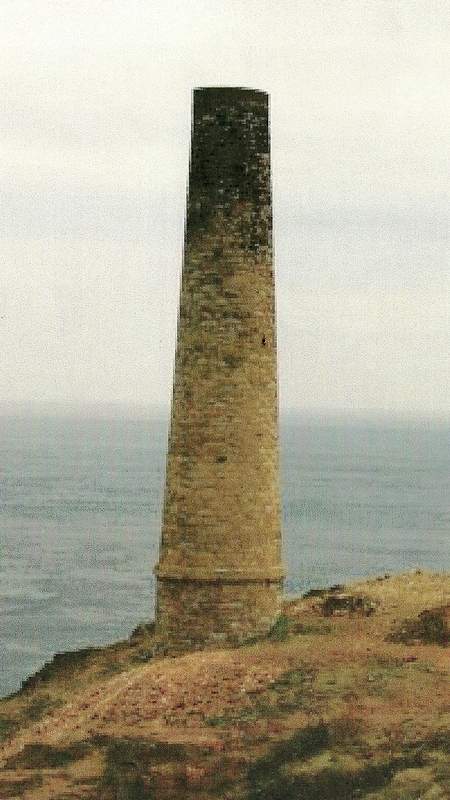 They were very familiar with the construction of the smoke stack towers at the mines in Cornwall, UK. 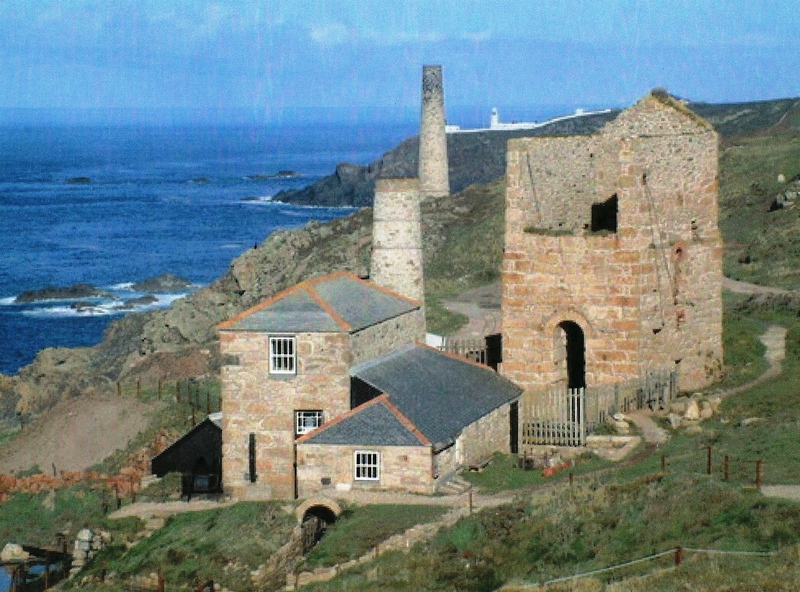 Joseph of Arimathea, a merchant of metals, is said to have visited Cornwall with his Nephew Jesus. 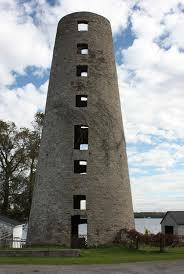 The construction of the Maitland Tower, except for the windows, is identical to the towers constructed by the Celts in Cornwall, UK which were visited by the Farams on a regular basis. 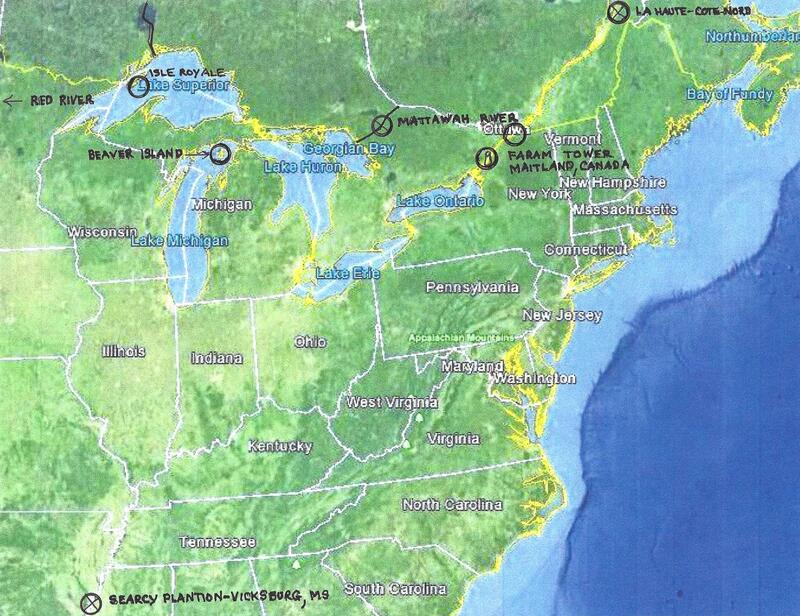 Further evidence that Europeans were in the Great Lakes are the numerous, unexplained, ancient mining sites in the area. 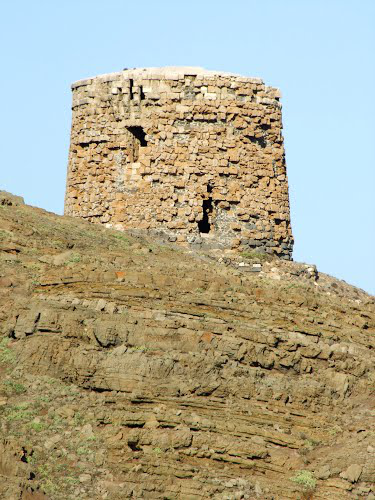 A Templar defensive position, of similar construction as the Maitland Tower, located in Minorca, Spain. In order to understand that the Norse/Vikings had ventured outside of the territory allotted to them, by the Denmark/Norway Alliance c1000CE, it is necessary to know the boundaries of that territory. As mentioned previously the alliance, as civilizations before them had done, developed a geoglyph which set the bounaries of the Viking territory. Due to the extreme cold of the Little Ice Age the Norse were forced to move south from Greenland and Iceland. Although they had been allotted land, south of Greenland, which was habitable during the Little Ice Age, they ventured south of their territory and occupied the land around the Saint Lawrence Seaway and the Great Lakes. This land, as evidenced by other geoglyphs around Europe and North America, had been claimed by the Celts and Templars long before this. The following images show the Tiniteqilaq geoglyph which was created to outline the territory ceded to the Vikings by the Denmark/Norway alliance. The geoglyphic structures within the walls of the geoglyph are difficult to see in this and the following image. The bearings were obtained under much higher magnification. The bearings are generated from the angle of the walls as well as the square and circular objects within the walls of the geoglyph. The Territory allotted, by the Denmark/Norway Alliance c1000CE, for colonization by the Vikings . The tips of the radials, in the image above, denote the territorial limits of the Viking Territory. 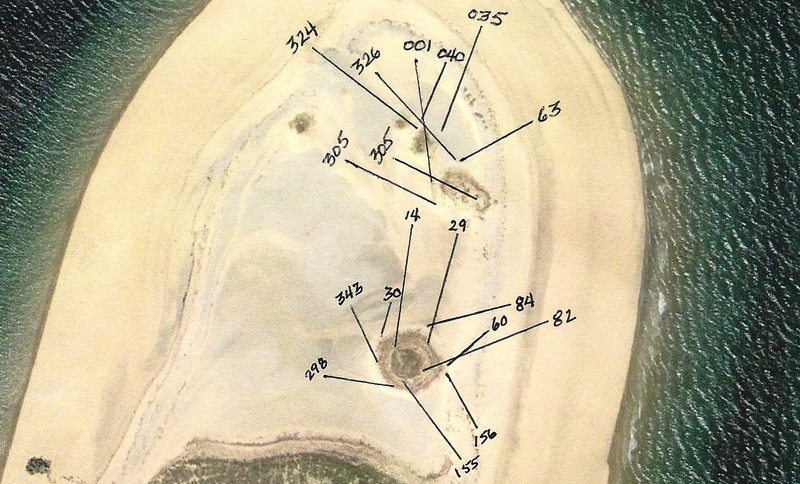 There is one radial which points to the location where the Newport Tower, RI was built. This is not part of the Viking territory. As is customary in constructing major geoglyphs, one radial points to the major geoglyph that makes up the adjoining territory. The territory, south of the dark line, is the territory previously claimed by the Celts and Templars and is the territory over which the Norse/Templar battles were fought. In order to understand geoglyphology it is necessary to know that many structures have been built at locations which were important to a previous ancient society which laid out the original Geoglyphs. 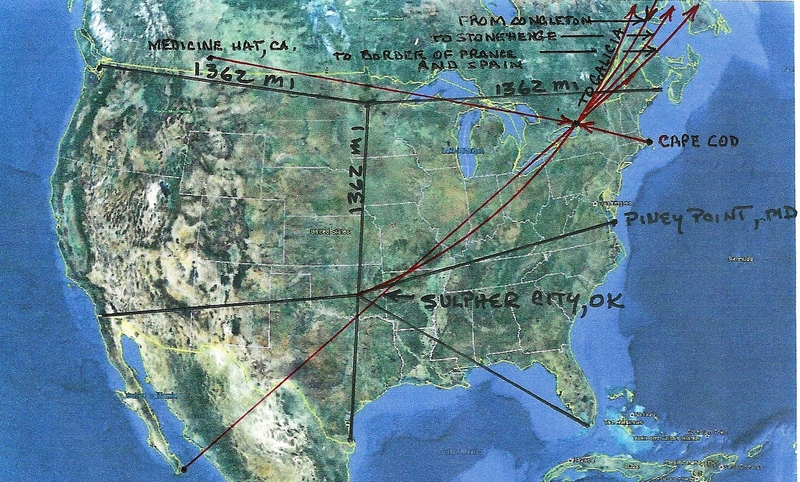 (The lines generated by geoglyphs are totally different from Ley Lines) The heads of State of most of the major societies have known of the existence of Geoglyphology for thousands of years. Most of the post historic structures are simply being built on the locations which were important to, and passed down from, the ancients. This could not be more evident than the Golfo de Cintra Geoglyphs mentioned later. The Gulfo de Cintra geoglyph is has been scientifically tested to be over 9000 years old and yet it points to structures which did not exist at the time it was constructed. Historical records tell us that, after their ban from Norway the Celtic Scotts allowed the Vikings, and their successors, to occupy the Hebrides Islands west of Scotland. This fact is also validated in the Viking Territorial boundaries outlined by the Tiniteqilaq Geoglyph. The Celts, Vikings and Norse had been allies from the time the Vikings came into existance. Documented history tells us that this hospitality ended in the 14th Century when the Scotts forced the Norse out of the Hebrides, Islands, presumably because of the conflict in North America. People familiar with the Vikings in America know that the Norse were eventually forced to enter the Great Lakes area through Hudson Bay, a much longer and difficult way to the Lakes. This was due, in part, to the main defensive positions at Maitland and other lesser outposts, which the Celts and Templars placed along the Saint Lawrence Seaway. For more information on the Viking presence in North America please Google: "Viking Runestones in America". 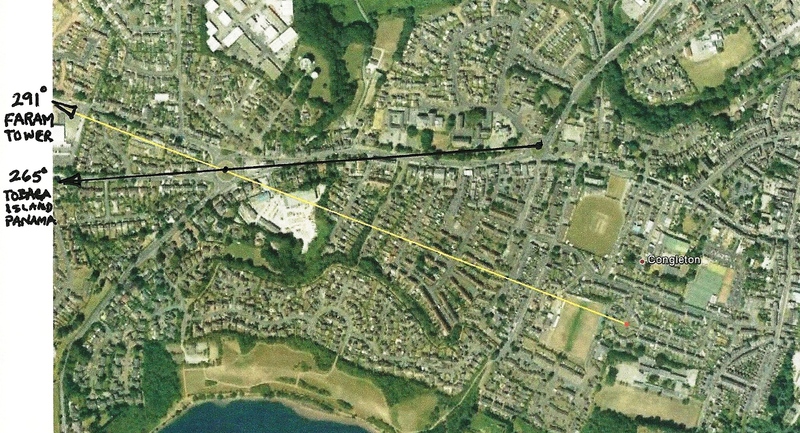 Note that the Faram outposts exist below, but within, the yellow line. The yellow line is the northern boundary of the territory which the Templars were protecting. 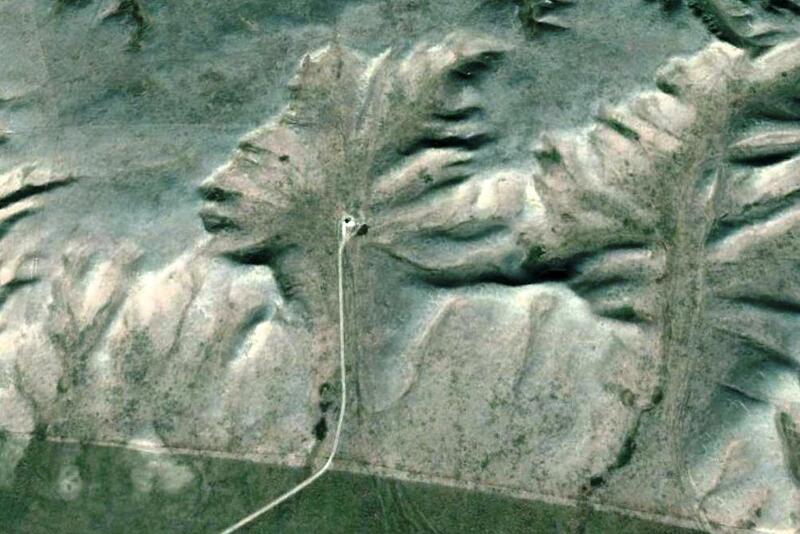 This ancient boundary is confirmed by many European and North American geoglyphs. The boundary was relocated south, starting with the treaty of Paris, after the Revolutionary War. 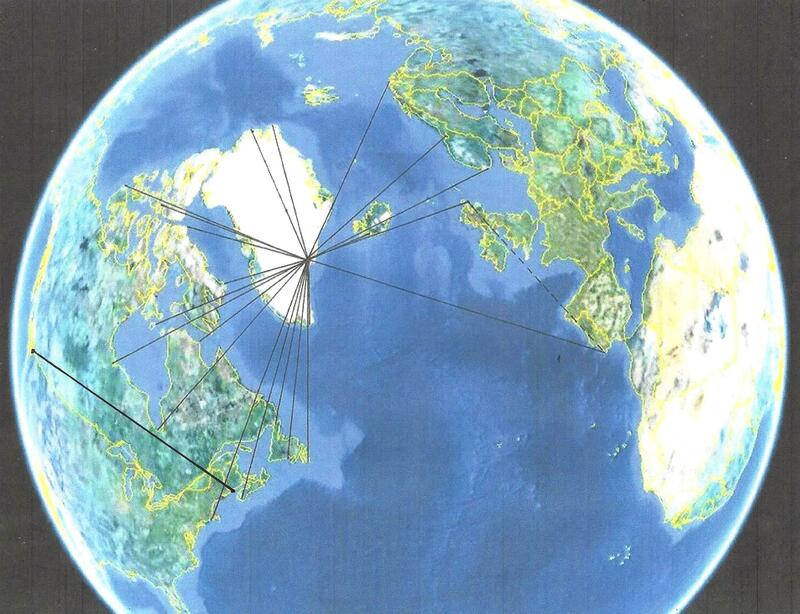 The above image depicts Templar navel bases from which they dispatched their ships against the Norse. The Radial Emanating From the City of Congleton, UK and Ending at Faram Tower. The main geoglyph which ties the Farams to the Maitland Tower is in the town of Congleton, UK. Archaeological digs have shown that the town was first occupied c10,200 BCE. The first historical reference to the town occurred in 1282 CE. The Farams constructed the first church built in Congleton and laid out the first streets. As you can see in the preceding image one of the geoglyphic radials emanates from the traffic circles and points to the Maitland Tower. Traffic Circles, and circles in general, are frequently used as pointers in Geoglyphology. (See: http://www.thefaramfoundation.com/geoglyphs.htm ) Tobaga Island is located off the west coast of Panama, near the Panama Canal. The significance of the Tobaga Island location is that this was the southern limit of an ancient territory which stretched from the yellow boundary line shown previously, just above Maitland Tower, to where the Panama Canal currently exists. 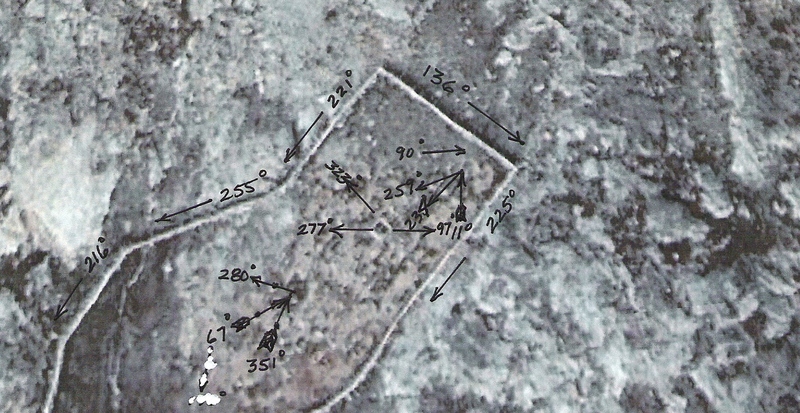 This same location is pointed out by the Mexico City Geoglyph shown below. 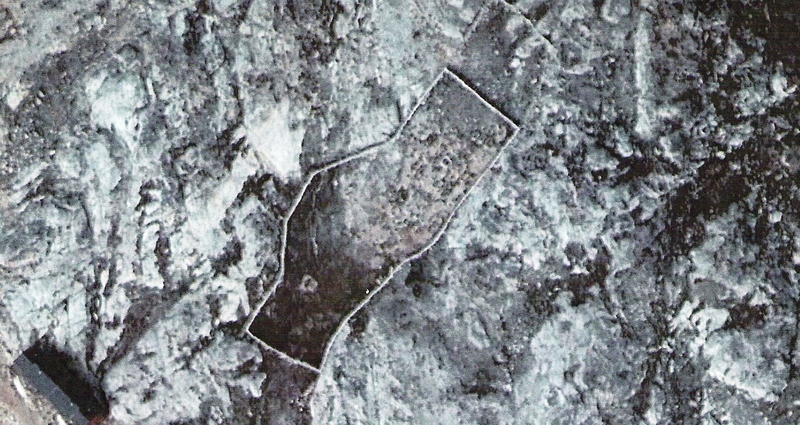 This and other geoglyphs are physical evidence of the Faram involvement with the origin of the tower. Other pointers to the place where the Faram Tower is now located were placed in North America by the Celts and Templars prior to 1500AD. The Templars presence in North America has been verified by families which owned land on the Mississippi river since the time of the Templars. The 305 Radial, Running From Cape Cod to Maitland Tower. Notice that the 305 radial, pointing to the Maitland Tower has its own linier indicator. That is significant. Some of the lines are not visible in this image. The bearings were measured using much higher magnification. The Floating Geoglyph Located on the Lake in Mexico City When Cortez Invaded Mexico in 1519CE. This Geoglyph also points to the location where the Newport Tower would eventually be built. 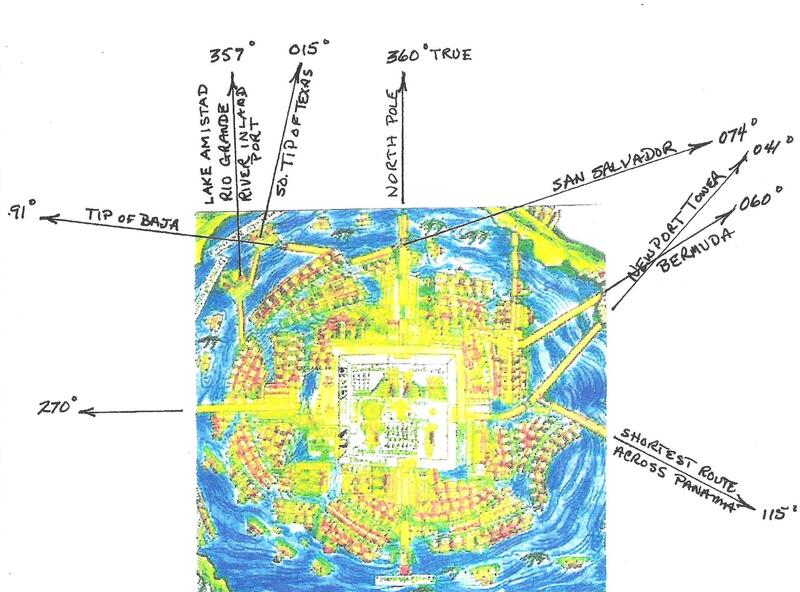 The fact that Aztec, Ancient, and the Celtic geoglyphs point to the location where the Newport Tower would be built provides evidence that the Celts and Aztecs were associated. It is most likely that the white men, for which the Aztecs were waiting to return to Mexico City, were the Celts. The Medicine Hat Aztec Image aka "The Badlands Guardian"
The Medicine Hat geoglyph is a very complex geoglyph which covers over three miles of land. The center piece is the head of Montezuma which is depicted above. However; their are other Mayan and Olmec depictions included within the geoglyph. On the ground in the valley surrounding this geoglyph there are linier and circular geoglyphs which tell a story. (See: http://www.thefaramresearchfoundation/medicinehatcanada.htm ) In the next image you will see some of those linier patterns. The point of depicting this geoglyph is that the Medicine Hat 090 degree radial points to the Faram/Maitland Tower. 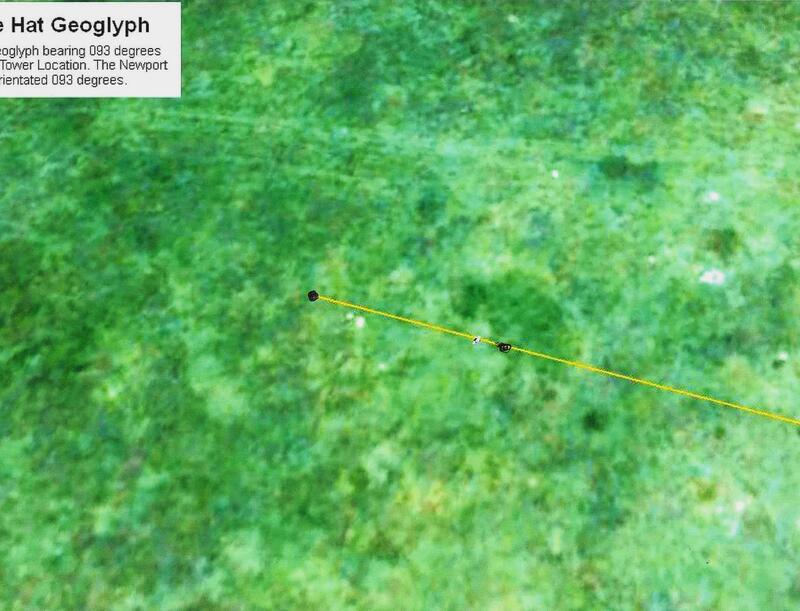 The 090 bearing from any geoglyph is reserved for the most mportant point which is identified by that geoglyph. Did the Templars construct the Medicine Hat geoglyphs? They were in the area. 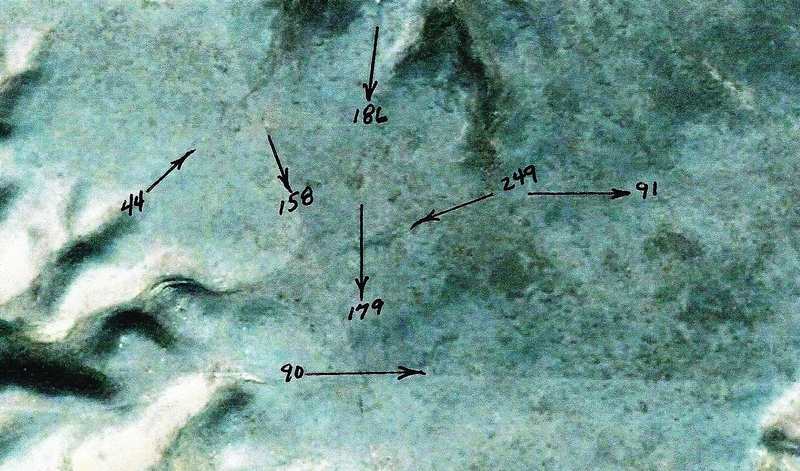 Some of the geoglyphic locations depicted in this article were mapped out by the ancients long before the current structures were built on them. Endpoints for the bearings displayed in the above photo. All of the afore mentioned endpoints have a significant geoglyph on or near them. This geoglyph consists of two circles and is one of the geoglyphs located near the Medicine Hat Indian head. The ancient protocol, when two circles are encountered, is to run a line from the center of the large circle through the center of the smaller circle. This particular geoglyph points to the important location where the Newport Tower, RI. is located. This Medicine Hat radial surveys out to be 093 degrees. The Newport Tower is also oriented to 093 degrees. By using Google Earth to extend the 093 bearing from the Newport Tower we end at Dakhla, Africa, home of the Golfo de Cintra geoglyphs. The Golfo de Cintra geoglyphs were first located by the Faram Foundation using Geoglyphology. The reason the Medicine Hat geoglyph is mentioned here is because it points out both the Maitland Tower and the all important Newport Tower in the same set of geoglyphs. This is a ground shot of the 9000 year old Golfo de Cintra geoglyph. The poured cement circles sit atop pedestals formed by 9000 years of wind blowing out the sand around them. The weight of the cement keeps the sand beneath the concrete compacted. These are the geoglyphic radials formed by the cement circles. As you can see, the bearings point to structures which exist now but did not exist 9000 years ago. As seen in the next image the Golfo de Cintra Geoglyph points back to the Newport Tower. This seems to establish that there was an advanced civilization long before ours. 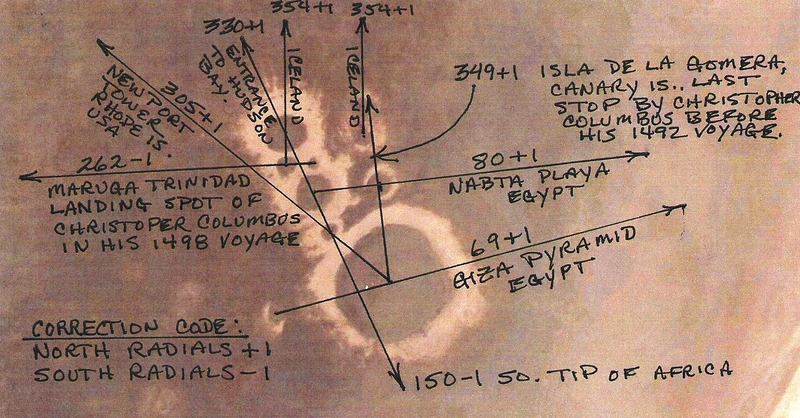 As shown above, the Golfo de Cintra Geoglyph points back to the Newport Tower. The Chinese pyramidal geoglyphs also point to the Newport Tower location. By this time you are most likely asking yourself; What do all these other geoglyphs have to do with the Maitland Tower? The other geoglyphs are included to show the relationship and importance of the geoglyphs pointing to, emanating from, and connected to the Maitland Tower. They are also included to verify that the Maitland Tower is a location of importance. 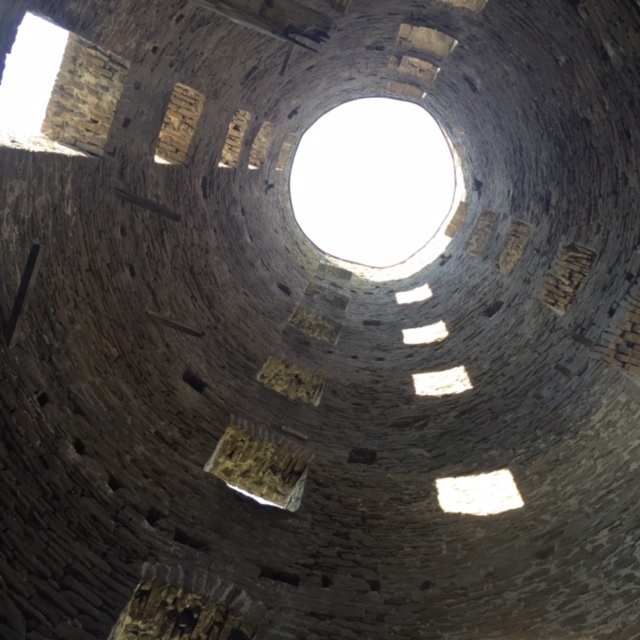 The reason the Newport Tower is mentioned in this article is because it plays a major pole in establishing the validity of both Geoglyphology and the Maitland Tower. Remember that the Medicine Hat geoglyph pointed to both the Maitland Tower location and the Newport Tower location. 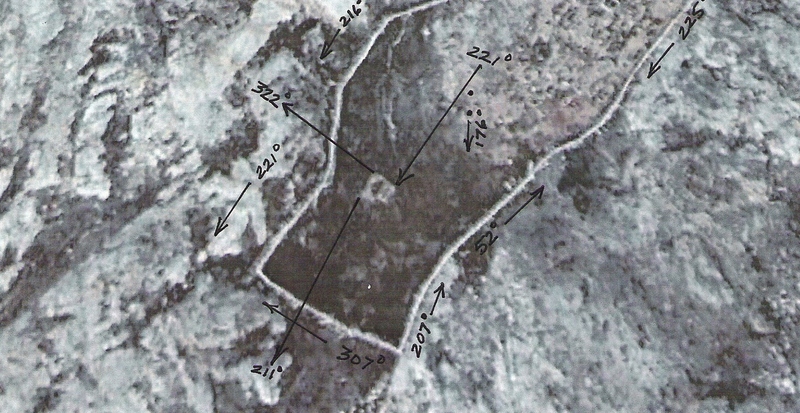 Bearings Emanating from the Geoglyphs Located on the Maitland Tower Property. This is an aerial view of the property on which the Maitland Tower sits. As is the protocol, in such cases, there are geoglyphs placed around most major monuments to tell a story. These stories could be outlining a territory, showing where the builder was from, telling of the travels of the individual. In this case it appears that it is all of the above. Although the bearings seem to point in indiscriminant directions they are actually well thought out and show that the builder had a true knowledge of the geography of the world. The geoglyphs on the left were determined from an array of stones placed on the ground. The geoglyphs on the right were determined by articles built on the property. The geoglyphs on the property may or may not be as old as the tower itself. The most important geoglyphs which tie the Tower to the Templars and the Farams are the geoglyphs which may or may not still be located around Maitland Tower. The initial readings were achieved using higher magnification than what is used in this photo. 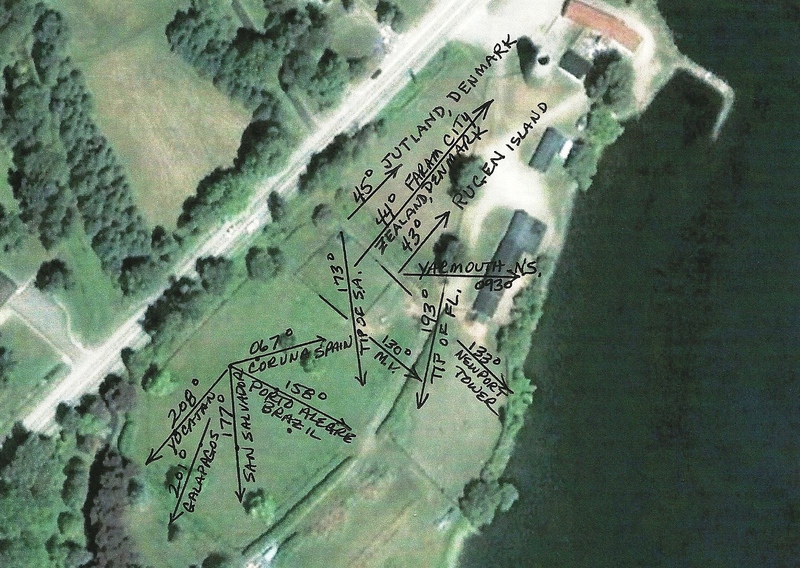 The three radials pointing to Denmark show a definite affinity for that location. The Celtic Farams lived in Zealand, Denmark from 700 AD to 1398 AD. The 067 degree radial not only points to Galicia, but to the very town, Coruna, that the Farams inhabited from before 43BC to 700 AD. 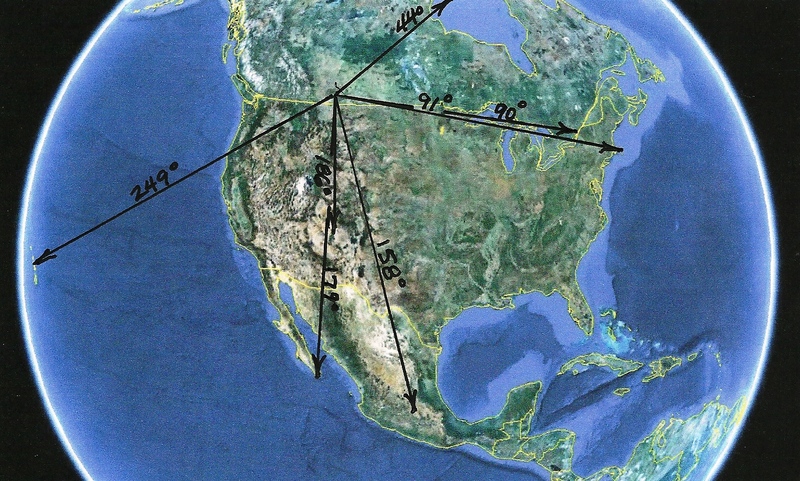 The 133 degree radial points to a key geoglyph, the Newport Tower, RI, which delineates the North American Territory, the territory which later became the United States. The 177 degree radial points to San Salvador Island, the landing place of Christopher Columbus on his first voyage to the Americas. Knowing this information one would have to ask why he chose this particular spot to highlight his voyage. 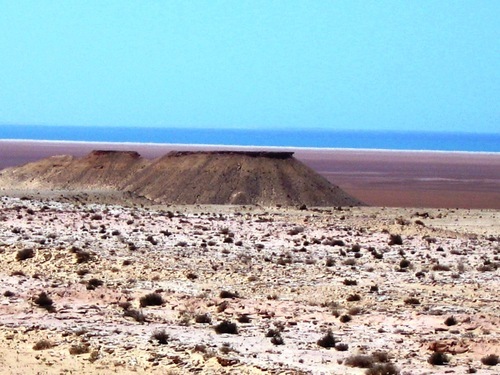 The tip of Florida, the tip of South America, the Galapagos Islands, and the Tip of Yucatan, are all very important sites which conform to the protocols used in Geoglyphology. These particular sites, and others, are often used as reference points by the Celts and their ancient ancestors. CONCLUSION: As I am sure you are beginning to see these survey markers were not placed indiscriminately around the world, but were carefully thought out before they were placed. This is true of all major geoglyphs. This precise surveying must be done for the geoglyph to deliver the message that it was intended to send. One would have to ask; how were the ancients able to map and calculate all this data? It seems that the ancient maps which showed territories not yet discovered may not have been myths after all. The Maitland Tower played a major part in the conflict by the Templars to regain the territory encroached on by the Norse. Although it appears that the Tower did not play a major role in ancient history it is evident that its construction, and the geoglyphs around it, were designed to identify and memorialize the builders.